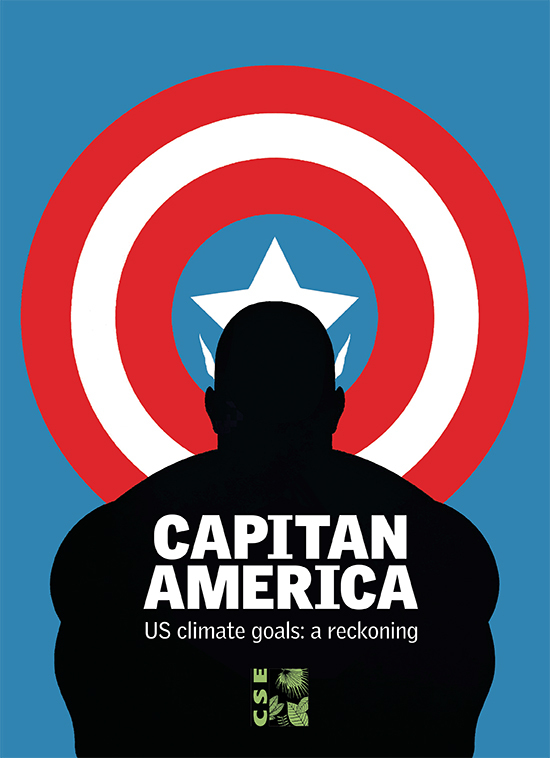 The US is making much ado about nothing when it comes to its commitments to fight climate change, says "Capitan America", a new book released by Delhi-based non-profit Centre for Science and Environment (CSE). The book reveals that the US INDCs, widely welcomed as an indication of the country's changing stance on climate change, are neither ambitious nor equitable. In fact, the book claims that the US economy will "disproportionately hog" the remaining carbon space. “Our analysis shows that the key economic sectors of the US economy—energy, transport, industry– are operating and would continue to operate till 2030 in a business-as-usual way, even as the rest of the world gears up to fight climate change,” says CSE Director General Sunita Narain. In a scathing criticism, the book says the US is not doing anything extra for climate change and that most of the changes are happening naturally and automatically because of economic reasons and market forces. “The US has not put in place policies to shift its economy towards low carbon. The result is the US will produce and consume 20 per cent more fossil fuels in 2030 than what it does today. Renewable energy will only contribute about 15 per cent of primary energy in 2030—up from 11 per cent currently,” says CSE Deputy Director General Chandra Bhushan. The Clean Power Plan (CPP), the most ambitious climate action of US President Obama to reduce emissions from the power sector, is even less ambitious than business-as-usual, the book notes. 2005-2014, electricity sector emissions reduced 1.8 per cent annually, largely due to a switch from coal to natural gas. Under CPP, it will reduce only by 1.6 per cent from now till 2030. Even in 2030, about 60 per cent of US’s electricity will be produced from coal and gas. Trends in the US transport sector have nothing to cheer about either. Even as countries attempt to integrate public transport into commuting practices to reduce congestion and air pollution, US per capita trips using public transport have declined and stagnated. Eighty-six per cent Americans commute using the car—a trend that shows no signs of changing. Passenger car emissions are growing every year by 1 per cent, and 2017 is projected to be the year of peak car sales. “Our analysis shows that the over-reliance of the US on fuel efficiency standards for vehicles is not sufficient. As vehicles are becoming more efficient, Americans are driving more. The US will have to move away from private cars” says Narain. The energy efficiency norms for buldings in the US are voluntary and weak, the book adds. Moreover, Americans are building bigger houses and buying more appliances negating any gains in efficiency improvements. The book says there is no evidence of a policy-driven downward trend in US greenhouse gas emissions post-2005. In fact, as the economy is picking up, so is consumption and consequently, emissions. By not taking ambitious action, the US is shifting the burden of fighting climate change on to other countries, says CSE. It explains that the US has been the biggest divisive force in the UN climate change negotiations. The no-domestic-action approach of the US has transformed the UN Climate Change Convention from a forum where every nation was supposed to take action based on “common but differentiated responsibilities and respective capabilities” to a forum where nations are competing in a race to the bottom. In context of the Paris conference in December, she asks, “The big question confronting the world is should the climate convention again be tailored—as was done in Cancun in 2010 and Durban in 2011—to suit the convenience of the US?" What about India's INDC's? How committed and sincere are we?